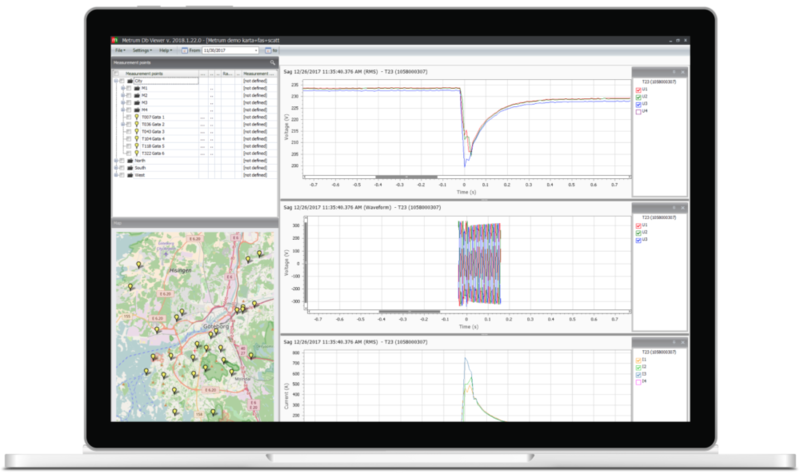 Metrum's fully measurement system PQ Controller DB is a powerful tool for monitoring strategic points at all levels of the grid. With a focus on efficiency and user-friendliness, data regarding energy, power quality and interference analysis is continuously collected and presented. Metrum’s intelligent instruments for measuring energy and power quality, for example PQ120, PQ140 and Metrum SC, are connected to the PQ Controller DB. All measuring instruments are adapted for connection in different parts of the grid – from high voltage to low voltage. In order to adapt the system to the customer’s needs, it is possible to install a number of modules that complement the functionality of the basic design. Modules include GIS, Management Web Reports, System integration, DB Web, and Power Monitor. The intelligent PQ Controller DB includes a range of user friendly analysis tools, and measurement data is presented through graphic illustrations adjusted to the user's wishes. Henceforth, PQ Controller DB assists the customer to implement cost saving interventions.